How to Completely Delete LINE App and Data from iPhone iOS 12? 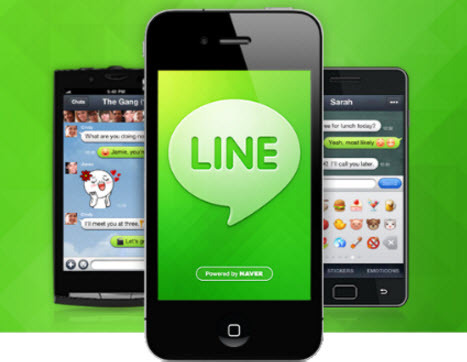 LINE is one of the rising messaging apps with over 600 million users all over the world as of December 2016. Probably, you should know that LINE makes communication very easy and stress free, but LINE Pay would always require credit card services. By signing up for LINE Pay and adding your credit card details, home address, passwords, etc. you will need to be mindful over protecting your privacy. Therefore, one of the best ways of protecting your privacy while using LINE App is to delete LINE app from your iPhone iOS 12. There are several ways to delete iPhone LINE app in the case of an emergency or just for iPhone privacy leak protection. We shall be discussing 4 salient ways to manage, delete or uninstall your LINE app as follows. Method 2: Clear up LINE Hidden Data from iOS 12: Caches, Corrupt Files, etc. Simply deleting data may not be sufficient in protecting your privacy and credit card details, you may need to eliminate every compromising LINE app data on your iPhone in other to avoid privacy leak especially when selling or giving away your iPhone, iPad or iPod touch. Erase LINE Chats: It scans your iPhone LINE messages and chats and lets you preview the data. You can completely destroy unwanted LINE data. Wipe Deleted LINE Data: Previously deleted LINE files will be found and permanently erased from iPhone, leaving no traces. 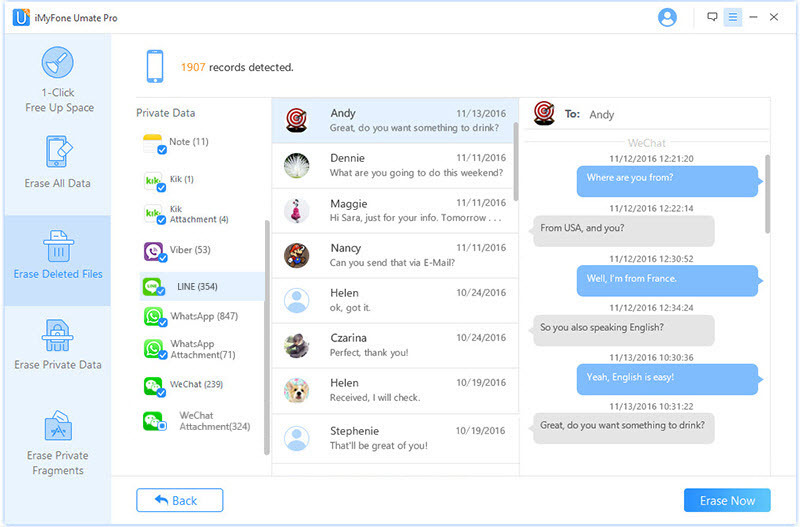 Support to erase also messages, call logs, notes, photos, videos, WhatsApp, Kik, Viber and more files. Connect your iPhone to computer and run iMyFone Umate Pro. Choose the erasing modes - you can click "Erase Private Data" to erase existing LINE data or choose "Erase Deleted Files" to wipe deleted files. Then click "Scan" to proceed. When scanning finishes, you can preview LINE files and select unwanted data. Click "Erase Now". Then confirm your action by typing "delete". Why should We Permanently Erase iPhone Data? Permanently erasing iPhone data is paramount in protecting your device's data in order to keep your privacy protected. Erasing your iPhone data should be a recurrent occurrence in order to reduce the amount of personal data on your iPhone, and the best way to keep private data at the barest minimum is through iMyFone Umate Pro. Umate Pro not only repeatedly overwrites the original data but also wipes the data from iPhone and its device drive. That's the only way to make data 100% unrecoverable. 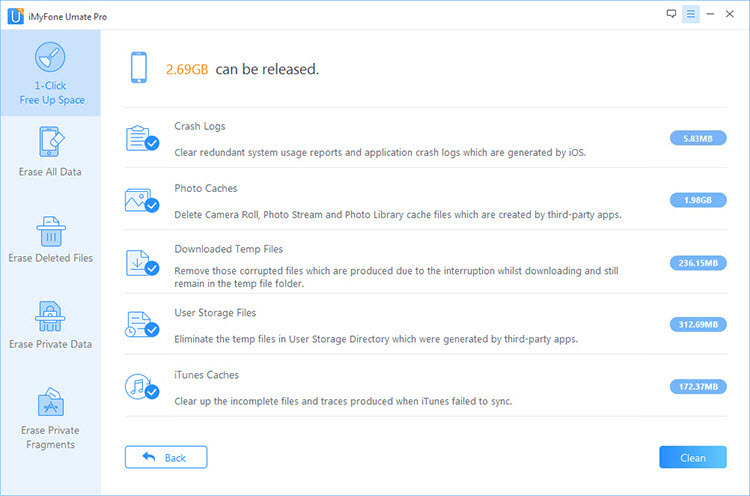 iMyFone Umate Pro is also able to delete LINE App caches, crash logs, corrupt files and private fragments from your iOS 12 devices. The removal of junk files is totally FREE, we don’t need to pay for it. Remove Junk Files Free: 1 click to clean all app cache, crash logs, corrupted files and other 30+ types of useless files from iPhone. Clear Temp Files: Clearing a great amount of temporary files will save you huge space and optimize iPhone performance. Wipe Private Fragments: Scan and completely erase any private traces left by LINE or other 3rd-party apps. Step 1: Download, install and launch iMyFone Umate Pro on your computer, then connect your iPhone to your PC to start the process. Step 2: Select the "1-Click Cleanup" option from the startup menu, and click on "Quick Scan" for a full space saving analysis. Step 3:Click each "clean" button to release space for iPhone/iPad/iPod Touch. After cleaning the needless and useless LINE app files, you will see how much storage space has been released and how much space you can release by using other functions. Step 1: Open LINE app on your iPhone and click on "More" from the Main Menu. Step 2: Click on "Settings". Step 3: Click on "Profile". Step 4: Click on "Delete Account" from the drop-down menu to complete the process. LINE lets you share photos, videos, voice messages, contacts, and location information with friends and co-workers. It also helps you to exchange stories with your close friends by sharing stickers, and other files on your timeLINE. However, these shared files are saved on your LINE app with other useless, junk, corrupt and cached files, and this brings the need to uninstall LINE app in order to get rid of these files. Step 1: Open your iDevice Homescreen and hold the LINE icon for few seconds until all the apps starts wiggling. Step 2: At this point, "X" will appear at the upper left corner of each icon including LINE, click on the "X" symbol. Step 3: A notification will appear asking you to confirm that you would like to delete LINE app from your iPhone, click on the "Delete" button to delete the LINE app. Step 4: A request asking you to rate the LINE app after uninstalling it will appear, you can click either "No Thanks" or "Rate Now" button to finish removing the app.